I wasn’t a stranger to ebooks. I have apps on the iPod that I use for reading in places like doctors’ waiting rooms, but the screen is too small to look at for long at a time; it would never do on an airplane, for instance. I have Kindle, Stanza, and Nook apps on my laptop as well. It’s great for reference materials, but not for kicking back on the couch with a mystery. 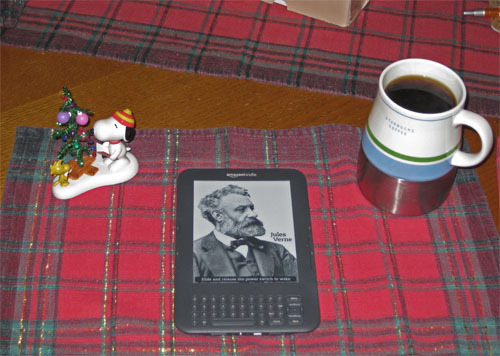 This year, after a lot of vacillation, I sent my letter to Santa, and he brought me a Kindle. So far, I love it. This no more negates my love of “real” books than enjoying an apple means I’m about to give up oranges, but it does raise some interesting questions. After charging the device and reading the instructions, I jumped on Amazon to find something new to read, and I wound up downloaded half a dozen free Kindle books in rapid fire – indulging the rare guilty-pleasure of judging books by their covers. Unfortunately, I deleted most of them after the first few pages; they were simply not very well written. I have often encouraged people by saying, “Everyone has a story to tell.” That is, everyone. Is it a bad thing that anyone who wants to can now post their ebook to Amazon? Aren’t many of my judgements arbitrary and conditioned by the literary and publishing status quo? I suppose it boils down to something simple. Everyone may have a story to tell, but that doesn’t mean I’m going to pay money to read it. And given a finite amount of time, there are some books I want to read before the others. My first new rule of thumb for managing the Kindle is this: never pay for (an unfamiliar) book that does not have a print edition I can search through first. I really understand why editors and agents emphasize the importance of the opening pages. I’m sure there will be further revelations. This entry was posted in Publishing, Writing and tagged ebooks, publishing, writing. Bookmark the permalink.